Aquamarine is the blue variety of the mineral beryl. 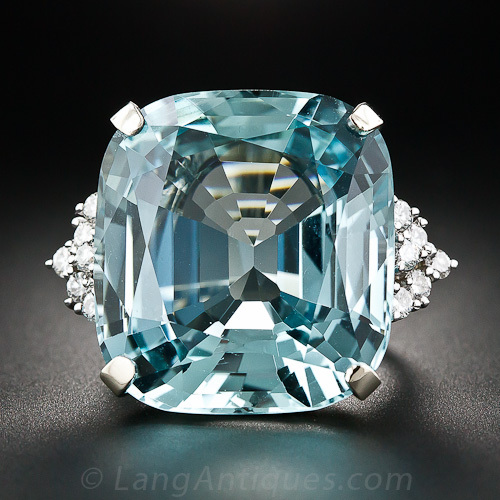 Most natural aquamarine is a pale bluish green, which was the preferred color before 1900. Today it is routinely heat treated to remove the green component, making it a stable and permanent blue color. Simply heating aquamarine to 800 degrees Fahrenheit, will remove any trace of green. The more intense, the blue color, the more valuable the gem will be. It is one of the most popular of all gemstones because it is not only complimentary to most skin types but also durable and affordable! The finest examples of aquamarine are found in Brazil, Nigeria, Zambia, Madagascar, Mozambique, Afghanistan and Pakistan. A new find of a rare variety of aquamarine, with a dark, highly saturated intensity, has been discovered in the Santa Maria de Itabira mine in Brazil. Similar aquas have also been found in a few gem mines in Africa, especially Mozambique. Aquamarine is the Latin name for "seawater" and has long been a symbol of eternal youth and happiness. The first documented use of aquamarine is between 480-300 BC. The ancient Greeks and Romans often used aquamarines for intaglio work and engravings. Wearing an aquamarine amulet, especially if it was engraved with Poseidon on his chariot, was thought to make sailors fearless and invincible to the perils of the sea. In 1920, a 243 pound aquamarine crystal was discovered in Brazil. It was sold, at the time, for only $25, 000. In 1935 the Brazilian government presented Mrs. Franklin Roosevelt with a 1, 847 carat aquamarine that is now displayed in the Hyde Park Museum in New York. Aquamarine is the Birthstone for March and the stone of Scorpio or Gemini. Aquamarine is thought to be a stone of courage. It can be used to alleviate fears and phobias. Aquas can help keep you on track to meet you goals and guarantee your success. It releases anxiety and can combat depression. Aquamarine is an excellent stone to aid in communication, as it stimulates the throat chakra. It is excellent for public speakers. Aqua promotes safe travel on water and helps one get in touch with the natural spirits of the sea. Physically, new age mystics have attributed aquamarine with the ability to help with ailments of the throat, mouth, ears, breathing allergies, spleen, heart, immune system, thymus, lymph nodes.